Fortunately for me, they showed up on September 20th, about a week before the first frost of the year. 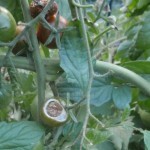 The tomato plants were well established and sustained little damage. 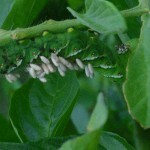 The hornworms also came under attack from the Braconid wasp. These wasps actually kill the hornworms. There were at least six of these hornworms on my tomato vines. The bell peppers were growing right next to the tomato plants this year. So it seems if given a choice, the hornworms will pick tomatoes over bell peppers. 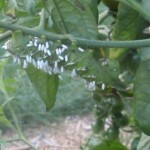 About half of the hornworms were doomed by the Braconid wasp, the others ended up as food for the chickens. 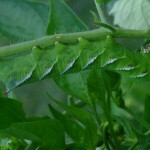 The gallery of tomato hornworm pictures (click any image so see a larger version). This hornworm will succumb to the Braconid wasp. This juicy caterpillar is like candy to chickens. The wasps have sucked the life out of this hornworm. This hornworm will also serve as food for the helpful Braconid wasp. The hornworms munched on this tomato. 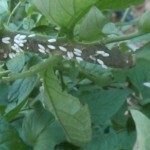 Have you ever dealt with tomato hornworms?